St. Patty's is nigh, and that can only mean one thing: Time to get hammered! Check out our favorite pre- and post-parade haunts to get your shamrock on. This Irish bar on steroids (pictured above) may be the only reason to visit the no man's land between Murray Hill and Koreatown. Do the St. Pat's Parade, an Irish tour, or a concert. Or, try something a little different. Here are your top 5 sober alternatives to pounding Guinness. East Village Irish pub (good for groups) that doesn't beat you over the head with all the usual Paddy signifiers. 510 E. 11th St.; 212-982-3929. A fish-and-chips shop that literally reeks of authenticity. Riverdale's homey tribute to Irish heritage and Guinness consumption. 445 W. 238th St; 718-884-7127. Perhaps the best of the city's blarneys, but not the place to discuss your plans to build or renovate with nonunion labor. 137 W. 33rd St.; 212-947-0825. An Irish pub that'll remind you why Irish pubs are so popular in the first place. Owner/author Sebastian Junger is the initial draw, but this traditional pub has much more to recommend it. 505 W. 23rd St.; 212-462-4300. Not what you'd expect alongside ultra-swank Torch or thrifty-chic Barramundi, but Iggy's is just what Ludlow Street needed. An intimate and welcoming neo-tavern, where no one will mind if you monopolize a window seat and nurse your pint all night. 15 E. 7th St.; 212-334-1390. An "authentic" Irish pub that actually lives up to that overused adjective. A revisionist Irish pub for those who think and drink big. 209 E. 5th St.; 212-477-0030. 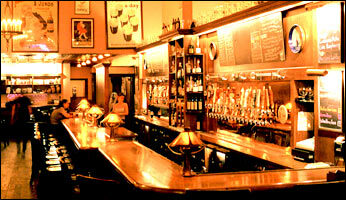 Pub appeal refined to the basics: dark wood, dim light, cozy seating and good beer (lots of it). 34 E. 4th St.; 212-260-3600. An Irish bar almost worth braving St. Patty's day crowds for. A welcome refuge for drinkers who've outgrown the usual Upper East Side bar crawl. 229 E. 84th St.; 212-327-4450.